Vembu, a rapidly evolving Backup & Disaster Recovery company, with their latest release, Vembu BDR Suite v3.7.0 has come up with a comprehensive free edition for data centers which deploy both virtual & physical environments. The free edition will be beneficial to all those who wish to try out Vembu BDR Suite in their production and testing environments without any costs. 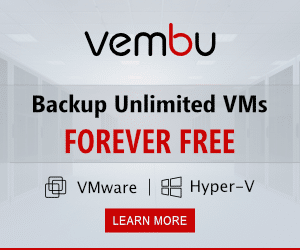 Vembu VMBackup Free Edition for VMware is offering backing up of unlimited VMs running on an ESXi and vCenter server without any costs involved especially for the businesses which do not have any sophisticated data protection method to protect their VMs. 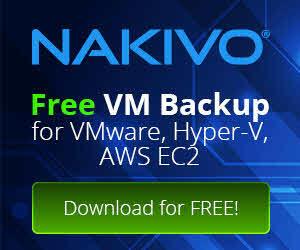 Vembu VMBackup Free Edition for Hyper-V is built to overcome the complexities in creating backup policies for VM’s running on Hyper-V server. 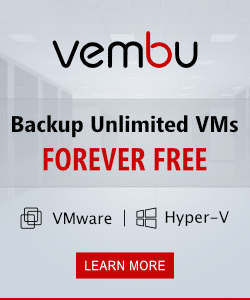 Vembu has developed its own proprietary driver to backup the Hyper-V VMs in an efficient manner especially with up to 5X improvement in performance over other backup software. VMBackup supports the VMs located in Hyper-V Cluster Shared Volumes and the Windows SMB share. Hyper-V backups take consistent snapshots application-specific highly transactional applications like Exchange Server, SQL Server using Microsoft VSS writer and truncate the transaction log files during the backup job. Vembu VMBackup free edition for Hyper-V is designed to protect the Microsoft’s server both at the Host level and VM level. Vembu was providing a free edition of its software only for workstations like Desktops & Laptops, but now it has been now extended to Windows Servers as well. Vembu ImageBackup Free Edition is a Backup and Disaster Recovery solution for physical Windows environment. It will backup entire disk image of Windows Servers, Desktops and Laptops including operating system, applications and files. Also, Vembu ImageBackup helps in migrating the windows machine from the physical environment to virtual environments like VMware or Hyper-V (P2V).